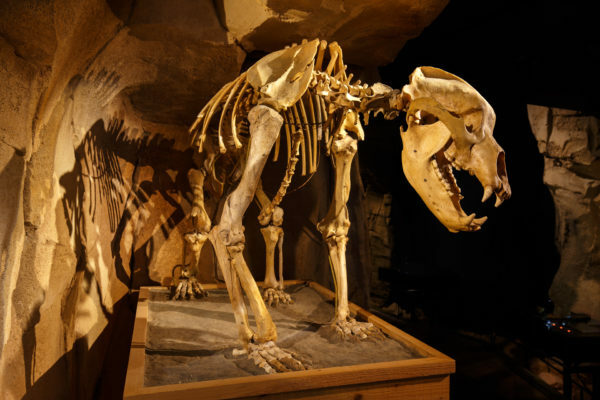 More than 25 000 years ago, in the Granier mountain range, the “La Balme à Collomb” cave was home to peculiar prehistoric inhabitants… Ursus spelaeus (cave bears). The Cave Bear Museum shines a light on this exceptional site and this emblematic animal that occupied this hibernation cave for thousands of years. The museum lets you travel back in time and follow in the footsteps (or should that be “pawprints”?) of this prehistoric bear. Interactive tables teach you about the cave bear’s physical characteristics and environment. During the visit, you become the scientists who excavated the bears’ cave. A viewing theatre and giant screen showing a 3D film and computer-generated images let you relive an exceptional scientific and human adventure. Extend your visit by checking out the latest temporary exhibition. Make the most of the gift shop. Relax in the museum’s bar area or enjoy its outdoor facilities (play and picnic areas). Visitors’ guide available in English from the reception desk. May, June and September: from Monday to Saturday from 2 p.m. to 6 p.m., Sundays and public holidays from 10 a.m. to 12.30 p.m. and from 2 p.m. to 6 p.m.
July and August: every day from 10 a.m. to 12.30 p.m. and from 2 p.m. to 6 p.m.
Only during school holidays from October to April, from Sunday to Friday from 2 p.m. to 6 p.m. Closed on Christmas Day and New Year’s Day. By road, the museum is: 1.5 hours from Lyon, 1 hour from Grenoble, and 30 minutes from Chambéry. By train: Chambéry or Grenoble. 100 metres from the museum, at the entrance to the Camping de l’Ourson. Cross the bridge and turn left. Museum 50 metres down from the dairy cooperative.